Hank and Tami Brackman are popcorn growers and suppliers in North Adams Michigan. They are a product with a cause, planting seeds of hope. As a survivor of domestic violence, Tami is determined to raise awareness and educate others. Coupled with Hank’s love for farming and antique farm equipment, Seed of Hope Strawberry Popcorn took root. They set out to plant a “Seed of Hope” for others who have been affected by domestic violence and Strawberry Popcorn has given them a platform to fulfill that vision. 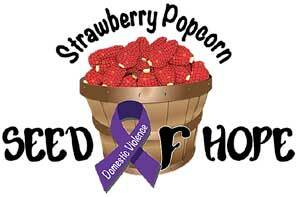 Proceeds from the sale of Strawberry Popcorn are donated to programs that support domestic violence awareness. Strawberry Popcorn has been a tradition in the Brackman family for over 35 years and they are excited to share it with their community for such a great cause. Driven by a love for antique tractors and a desire to rekindle the heart of what farming is all about, farming with 1950’s farm equipment became part of Hank’s dream. They take pride in preserving the land that is used and growing a wholesome, healthy snack for you to enjoy. 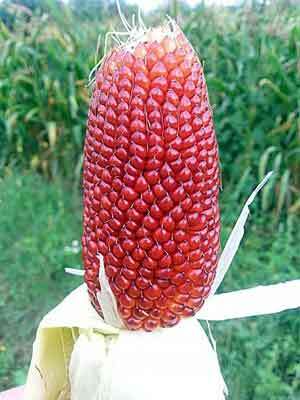 Strawberry Popcorn is one of the healthiest, tastiest snack foods available. It has 350 more antioxidants than white or yellow popcorn. When popped the kernels are small white and crunchy with no hard hulls. 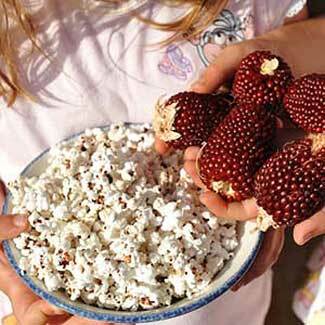 Unlike what you might guess from the name, Strawberry Popcorn does not taste like strawberries! The name comes from the small red ears which resemble strawberries. Pesticides and insecticides are not used and the popcorn is packaged all by hand. A purple ribbon is placed on the Seed of Hope logo as an awareness campaign against Domestic Violence. We invite you to try the Seed of Hope Strawberry Popcorn, available in 1 pound resealable package, 2 lb jar and 3 lb pail. The purple ribbon on the Strawberry Popcorn Seed of Hope logo represents helping those facing difficulties with domestic violence. Seed of Hope donates proceeds towards programs still needed to bring awareness to domestic violence. 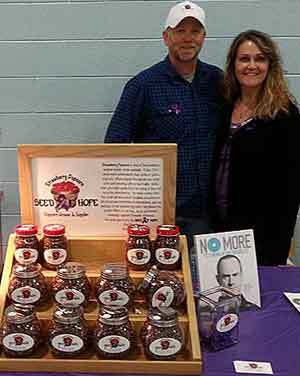 Hank and Tami, owners of Seed of Hope donates proceeds towards programs that bring awareness to domestic violence. A “Seed of Hope” is planted for others who have been affected by domestic violence and the strawberry popcorn sales helps to spread awareness. Buy Strawberry Popcorn by Seed of Hope! It was wonderful to meet you this weekend. The popcorn is fabulous and so is your cause.